Futuristic cumbia masters SOTOMAYOR from Mexico City are the featured headliners at this month’s CumbiaSazo! 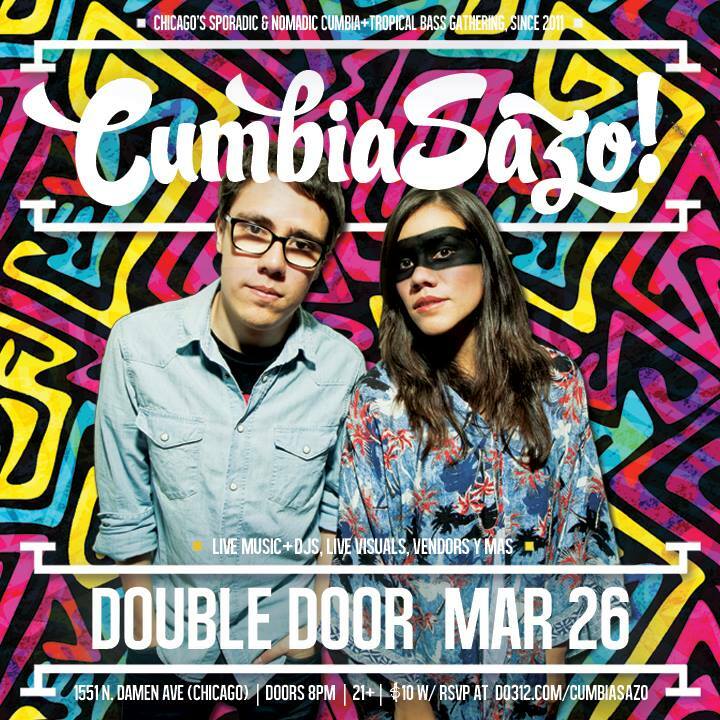 The dance party is this Saturday, March 26 at Double Door and includes special sets from Venezuelan-bred soundmaker BUMBAC JOE, CumbiaSazo’s own DJ CALIXTA and a growing family of visual artists and vendors. Expose your mind, body and soul to a fantastical world of art, music and culture. #OneLove y’all! RSVP and tickets available here. ¡ Piñatas Don Beto ! Sotomayor is an electronic music project with Latin American influence led by siblings Raul and Paulina Sotomayor. As a four-piece band, Sotomayor rescues cumbia and peruvian rhythms “chicha” and fuses them with forward-thinking & dance-heavy beats. Their first LP is called “Salvaje” and it was published in March 2015 by the Mexican NetLabel “Tropic-All “, and the UK label “New Hispanic Music”. Raul is best known as one half of “Beat Buffet”, a project that in 2013 published his debut album “Juegue”, selected as the “best Funk/Jazz/Fusion album of the Year” by IMAS (Independent Music Awards). He is also the creator of “DayOff”, a now infamous daytime party that presented “Global bass” acts like Dengue Dengue Dengue (Peru), Schlachthofbronx (Germany), and Frikstailers (Argentina), to name a few. Paulina is also the drummer of the rock/folk band “Jefes del Desierto”. The innovative sound of the band allowed them to feature at legendary festivals “Vive Latino” and “Festival Marvin” and they’ll be a featured artist at the upcoming SXSW in conjunction with their first US tour. caliXta DJs and VJs as an independent freelancer and as part of Chicago’s CumbiaSazo crew. Since 2012, caliXta has been honing her craft and realizing a vision of creating respectful and healing dancefloors. Although originally from Chicago, a lot of her formation & scheming around liberation and revolutionary partying started in DC from kickbacks with friends and the Maracuyeah & Anthology of Booty queer femme parties. Upon returning to Chicago in 2011, she felt like similar soul-elevating club spaces with beautiful and enriching music weren’t common and set out to co-founded dále shine to help create a scene for a deep & nuanced variety of digital Latinx music. In 2013, she joined the CumbiaSazo crew and found kindred spirits with which she could continue building communal spaces through art and music. Along her journey as an artist, caliXta has been fortunate to work with many talented artists, collectives, and organizations who continue to shape her visions and dreams. Bumbac Joe is the musical project of the Venezuelan Chicago-based DJ/producer Leopoldo Bello which explores Afro-Latin, jazz, tropical, and electronic beats. He’s been spinning for more than 10 years and has shared turntables with artists such as Armand Van Helden, Roy Davis Jr, Dany Howells, and Judge Jules and presentations with artists like Ojos de Brujo, Aterciopelados, Sinkane, Canteca de Macao, and Shantel & The Bucovina Club Orkestar. His original tracks can be found on various compilation discs such as “Venezuela Dance vol. 1”(Gozadera Records – USA/Venezuela), “Banti. Tarifa Summer Sessions (Banti records – Spain), “360 Noches” (Altamira Suites – Venezuela), “Soundial Loft[esque] Compilation” (Soundial Records – Canada), and a remix in “Nueva Onda Nueva, Electronic Aldemaro” (FNB Grabaciones – Venezuela). In 2006 released his first album, “Domestic Bar” (“Bar Doméstico a Domicilio”) with the support of José Luis Pardo, a.k.a. Dj Afro (exLos Amigos Invisibles guitarist) and in 2013 won the popular vote of the José James “Trouble” remix contest on Indaba Music.com.